Scotland’s ‘No’ vote solves one acute existential threat to the UK, says Patrick Dunleavy, but only for now. The likely narrow results of the May 2015 general election, plus David Cameron’s promise of another referendum on the UK leaving the European Union in 2017, both promise massive constitutional turbulence between now and 2020. For instance, if the UK votes to leave the European Union in 2017, a near-immediate rerun of the Scottish referendum could be on the cards, where voting to exit the UK would let Scots stay European citizens. With the votes all now in, the threat of the blue parts evaporating from the Union Jack completely has passed, and a Scotland with enhanced powers for its national Parliament will remain as part of the UK. There are already ominous signs that the extra powers will be less than full-blooded and slow to arrive, however. A technocratic businessman (Lord Smith of Kelvin) has been appointed to lead the Scottish changes, not a good sign that the proposals will be well thought through in constitutional terms. And David Cameron has today linked changes in Scotland to some solution of the problem of English legislation being voted on by Scottish MPs – where the timetable for any cross-party agreement is likely to stretch a long way past 2015. There have been previous efforts to fudge the ‘West Lothian’ question, of which the so-called ‘Fourth Reading’ in the Commons for English-only legislation now looks perhaps the best bet, despite its complications. Certainly, for Labour this could be the least worst of a range of highly unattractive ‘quick fix’ options. At its party Conference next week the party will have an opportunity to put wider constitutional reform on the table, as Ed Miliband hinted vaguely in some recent press articles. But in the past he has been evasive on this whole agenda. If Labour fails to propose coherent reform, and relapses into its traditional stance (‘we can win it within the classic two-party fix framework’), the party will show that its Bourbon traits (learn nothing and forget nothing) remain undimmed. 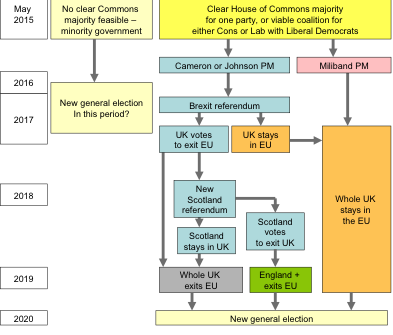 Look ahead for the next five or six years and it becomes apparent that the UK’s political and constitutional future is bestrewn with factors likely to create further political and constitutional turmoil as my chart below shows. The outcome of the May 2015 general election is the first problem. It is not shaping up so far into the kind of clear majority outcome for the Tories or Labour that they might have hoped. And the likely halving of Liberal Democrat MPs means that their attractiveness as coalition partners will fall radically. Their ability to feasibly go into coalition is also evaporating. The LibDems have just five Cabinet ministers now with 57 MPs. With (say) 25 MPs, their bargaining power in any future government and ability to shape decisions would also be halved. Another Conservative-Lib Dem coalition where they controlled only three Cabinet posts would be fatal for the party’s appeal – they would be irretrievably absorbed into the Tory image, like their National Liberal forerunners of the 1930s. A Labour-Liberal Democrat coalition is their only hope of any keeping alive remaining voter perception of the party as centrist or balanced. But little groundwork has been done by either side to make this happen. There is thus a good chance that the 2015 election outcome may not fall out in a way that makes anything but a minority government feasible, especially if the government has to be viable at a UK level and an England level. Within the Conservative party a second failure to win a clear election majority is likely to prove terminal for David Cameron’s weak and question-postponing style of leadership, especially with Boris Johnson returning to the Commons. We can’t see yet all the possibilities down this track, but there are gathering signs that an inconclusive 2015 general election would not mean another five year Parliament lasting to 2020, but perhaps another election by 2017 to try to resolve matters. A second possible outcome from 2015 is that Ed Miliband emerges as Prime Minister with either a tiny Labour majority or the prospect of an ‘easier’ coalition with the Liberal Democrats that could sustain his government for five years. With the Scots MPs still safely behind him, his position on UK-wide issues (tax, social security, defence, foreign affairs) would be assured. But the English legislation problem would assume significant proportions by 2017, especially with Johnson as Tory leader and a possible pepped up UKIP capacity vying to challenge the government as champions of the English interest. There would be no European Union referendum, however, and in many ways a secure Miliband premiership now remains the best prospect for UK economic and social stability to 2020. A third possible outcome from the 2015 general election is that Cameron does well enough either to win a Conservative outright majority, or to coerce the Liberal Democrats into a coalition renewal (despite the doom it threatens for them) or some other ‘confidence and supply’ arrangement. If Cameron returns as a secure premier, he will have to deliver on his Brexit referendum pledge on whether the UK stays or leaves the European Union in 2017. The Scottish referendum has shown how coercive referenda are as ways of resolving issues where citizens’ whole identities and major parcels of rights are involved. The same will be true of a Brexit vote. If after all the acrimony, the UK votes to stay in the EU then a degree of economic policy stability might return. But if the UK votes to leave the EU in 2017 many bets are off. Amidst a great deal of economic dislocation, one very real immediate effect might well be to re-open the issue of Scottish independence again. After all, Scotland has voted in 2014 to stay part of the UK-as-member-of-the-EU. Staying part of a UKIP, ‘little Englander’–dominated UK that is leaving the European Union could be quite a different matter. Scotland is one of the two most pro-EU regions, along with London. Westminster politicians now smugly see a ‘generational’ (i.e. 15 year) pause before another independence referendum threatens in Scotland, by which time the great catalyser Alex Salmond would presumably not be Scottish premier. But a Cameron (or even more a Johnson) Tory government, a fudged ‘devo max’ settlement, and an EU exit vote in 2017 could all combine to produce another Scottish independence referendum by 2018. Scots might then vote to leave the UK and thus stay in the EU, leaving only a rump of ‘England plus’ to retreat into European isolationism. The fundamental tension in the UK’s political system remains a transition to multi-party politics amongst citizens, combined with the resolutely self-interested behaviour of the Conservative and Labour elites and MPs in refusing any form of the necessary changes needed to acknowledge that change. The almost-exit of Scotland from the UK was just an outward sign of an inner corruption in the legitimacy of British democracy and the failing character of the UK’s un-codified and over-centralized constitutional arrangements. We live now in a time when democracies face renewed and acute challenges from dictatorships and authoritarian semi-democracies within the European neighbourhood itself, and far worse across other regions of the world. In this context, the repeated evidence of fragility in the British state, and political elites inability to tackle its long-run problems, and their relentless focusing on maximizing narrow, partisan advantage at all times, are deeply worrying symptoms of internal democratic decline. Patrick Dunleavy is Professor of Political Science and Public Policy in the Government department at LSE, and ANSZIG Centenary Research Professor at the University of Canberra, Australia. His most recent books are The Impact of the Social Sciences (co-authored, Sage, 2014) and Growing the Productivity of Government Services (co-authored, Edward Elgar 2013).